Another NHL Draft is upon us. This one could end up as one of the craziest drafts in recent memory. While there is a consensus top-two in some order, the rest of the first round is anyone’s guess. Even among our writers, there were a few surprises. So how did it all play out? We did a complete two-round mock draft. You’ll see picks 1-15 here. Stay tuned for picks 16-31 and all round two. So who ended up going first to the New Jersey Devils? 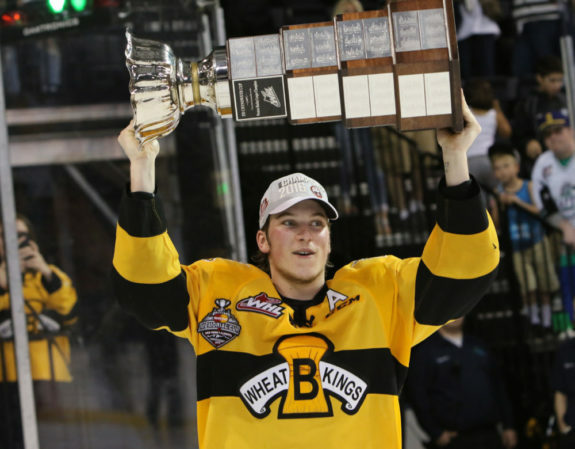 The New Jersey Devils select Nolan Patrick, filling an immediate need with size down the middle, opting for the player that has been projected no.1 overall for the better part of a year. He missed eligibility for last year’s draft by four days and his injuries scare us less than a player who rose up the draft ranks after a smaller sample size. The Flyers make the easiest decision of the draft, selecting Nico Hischier after the Devils took Nolan Patrick. Although he may not start at center in Philadelphia, Hischier’s terrific blend of talent and defensive acumen could lead to him being the heir to the Flyers’ top center spot after Claude Giroux. 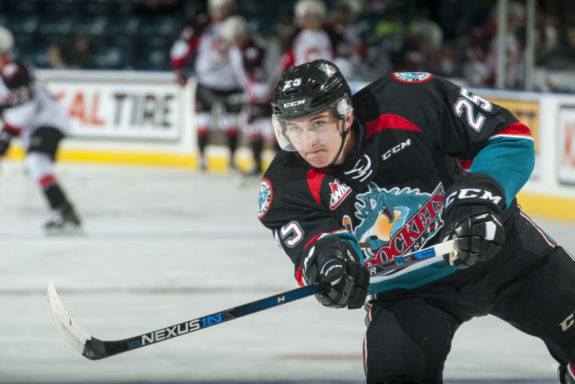 Will the Dallas Stars take Callan Foote with the overall #3 pick? It is highly unlikely. In fact, I doubt they will take anyone since GM Jim Nill is aggressively shopping for a trade with that first-round selection. The hiring of Ken Hitchcock and the signing of Ben Bishop show that the Stars are not entering a rebuilding phase, but are fixing the broken system they’ve had. At the #3 position this year, there is not an obvious difference maker who can come in as a rookie and be a major part of a push for a championship. And the Stars need to fill in some holes on the blue line, especially under Hitchcock’s system which focuses on defense. Callan Foote (6-foot-4, 200 pounds) is a big, strong defenseman with great blood lines (son of Adam Foote) who can possibly use his size the way Hitchcock used Derian Hatcher in his last stint as the Stars’ coach and have a chance to make an impact. Again, I don’t think the Stars will have this choice in the real draft, but if they are unable to trade the pick, Foote could fit into their plans. The Colorado Avalanche snatched Gabe Vilardi from the Windsor Spitfires with the number 4 overall selection. The kid’s obviously a winner, having just hoisted the Memorial Cup. Projected to go in the top three, Vilardi fell one spot when the Dallas Stars selected Callan Foote, which was very, very unexpected. We also had Miro Heiskanen on our short-list as far as defenseman, but we couldn’t pass up on Vilardi, who will bring a much-needed right-handed goal scoring threat into the fold. In his recent interview with Pierre LeBrun, Vancouver Canucks general manager Jim Benning said he believes his team can get a playmaking centre with the fifth overall pick. That statement solidifies the selection of Cody Glass at fifth overall. Glass has blossomed into a playmaking centre in the WHL, finishing with 0.68 primary points per game at even-strength this season. The only draft eligible players to better that feat in the CHL were Nico Hischier, Owen Tippett, and Kailer Yamamoto. Drafting Glass should give the Canucks a top-two centre for years to come. Casey Mittelstadt (6’1″, 201lbs) scored 21 goals and 64 points in 25 games for Eden Prairie High School, while adding another 30 points in 24 games for the Green Bay Gamblers of the USHL. The speedy, playmaking centre has committed to the University of Minnesota for the 2017-18 season, but has the potential to be a the Golden Knights’ top line centre in the not-so-distant future. With the surprising pick of Callan Foote with the third pick, Arizona would be proud to take Cale Makar. He may be undersized, but in today’s NHL, that doesn’t matter all that much. With him being committed to the University of Massachusetts-Amherst, the Coyotes can let him develop at his own pace. Hopefully by the time he is NHL-ready, the Coyotes will be in a better position to compete in the Western Conference. If there’s anything that really needs to be said, it’s that he’s been compared to Erik Karlsson. If he ends up even half as good as Karlsson, this is a great pick. 8. Buffalo – Chad DeDominicis – Miro Heiskanen (D) H.I.F.K. game. He’s a good skater and puck mover who can be impactful at both ends of the ice. If defenseman Timothy Liljegren is available by the time the 9th overall pick rolls around, the Detroit Red Wings would be wise to draft the Swedish offensive dynamo. Looking five years down the road at Detroit’s projected blueliners, Liljegren’s high caliber skating, shot, playmaking, and hockey IQ would fit in well with previous draft picks Dennis Cholowski, Filip Hronek, and Vili Saarijarvi. The right-handed, puck-moving defenseman would be a great addition to the Red Wings organization. With the 10th overall pick in the 2017 NHL Entry Draft, the Florida Panthers select from the OHL’s Mississauga Steelheads, right-wing Owen Tippett. Tippett has been labeled a “pure sniper” by some, exactly the sort of player the Cats have lacked since Pavel Bure patrolled the wing 15 years ago. Tippett should make his NHL début in a year or two, when he’ll battle the age-defying Jaromir Jagr for top-line minutes. The LA Kings are starving for offense, having finished 25th in league scoring in 2016-17. To make matters worse, their prospect cupboard is severely depleted following their Cup runs in ’12 and ’14. Suzuki is an élite finisher, having notched 45 goals and 96 points last season with Owen Sound. He has a great Hockey I.Q. and a tireless motor, making him a formidable penalty-killer as well. With their Cup-window closed and their prospect cupboard bare, Suzuki serves as an excellent building block toward their future. The Carolina Hurricanes need some size and up-front scoring. 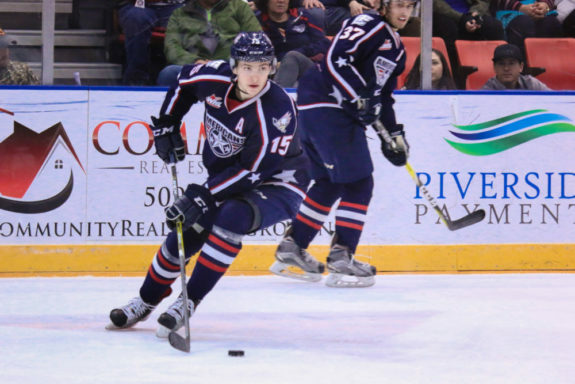 With Michael Rasmussen of the Tri-City Americans (WHL) they get both immediately, with the hope of even more as he matures. 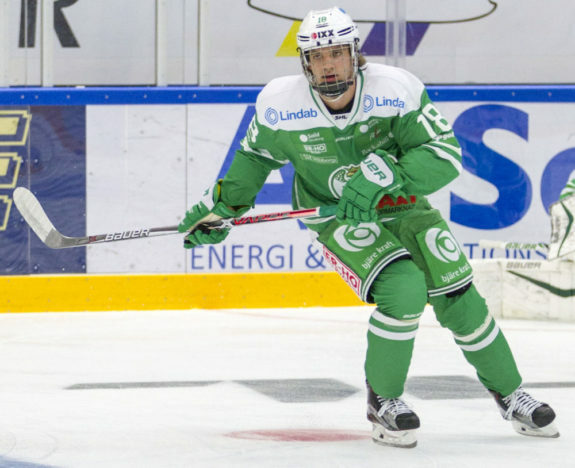 Standing just over six-feet, five-inches and weighing in at 221 pounds at the age of 18, Rasmussen has the potential to be a VERY BIG power forward. His scoring touch is also very evident at this point in his development — 235 points in 200 games over his last four regular seasons in juniors. The forward cupboard is overflowing for the Jets. Where they have struggled is on the back-end, specifically in net and in the left defensive position. The Jets have two solid goalie prospects, so it makes more sense to focus on defence. Valimaki is a big, intelligent body that is positionally sound. His hockey IQ is quite high, meaning that he won’t be caught out of position. The Jets have also had great success in recent years with skaters from outside of North America. A top four of Trouba-Morrissey and Valimaki-Byfuglien should have every Jets fan drooling. Kostin is one of the most dynamic talents in this draft and the Lightning are thrilled to take him with the 14th pick. Although there are some concerns about Kostin, putting him with this core will only make the Lightning better. After seeing Nick Suzuki taken 11th by the Kings, the Islanders took the next best center available in Poehling. He’s still a little raw but projects as a 2-way center who can excel at both ends of the ice. Having someone like John Tavares to mentor him will do wonders for his development. We are halfway through the first round. Stay tuned later as we will have the rest of round one and all round two coming your way.